With good reason the cuisine is famous. Oaxaca treats food with a special reverence. Visit any market and you'll see an abundance of tasty specialties you won't find elsewhere in the world and often nowhere else in Mexico! What to order? For those not familiar with the cuisine, order the Botana Oaxaqueña. This is a crowd-pleasing appetizer plate with a tasty mix of traditional delicacies, including thin strips of grilled beef (tasajo) and pork (cecina), sausage links (chorizo) and several kinds of cheese, including queso and quesillo. There may be tamales, chiles rellenos and memelas. Grasshoppers are often served on the side. Buen provecho! Caldo de Piedra is run by the Gauchupin family from San Felipe Usila. The palapa-style restaurant is located on the north side of the highway, kilometer 11.9 heading to Tule from Oaxaca City. The restaurant serves Chinanteco cuisine, including the famous Caldo de Piedra, literally 'stone soup' made with fish, shrimp and a few fire-hot stones. The dish is individually prepared -- ideal for those who do not want shrimp, the ingredient is simply left out -- and visitors are invited to watch the process. - The bakery is open Monday-Saturday from 6am-9pm. - Istmo-styled food is served at this restaurant open 1pm-11pm Monday-Saturday. One block west of Santo Domingo. Excellent hot chocolate! - Istmo-styled food is the specialty. Featured dishes include Dry Shrimp Mole (Mole de Camaron Seco). 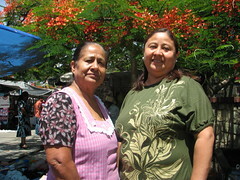 - Traditional Oaxacan cuisine has been served since 1977 at this popular restaurant on the south side of Labastida Park. Owner Petra Diaz serves some of the best food in the country. - 'Cocina mestiza' and open daily 1pm-11pm. - Intimate locale in front of the Cruz de la Piedra and the Arquitos. Hours vary. - Across from the southern side of Santo Domingo, pleasant patio and great coffee. Wheelchair and bike-friendly! - Great coffee and wireless internet. - Fresh food and wonderful meals ... just two blocks northeast of Santo Domingo. Fine salads and tasty comida corrida. - Inexpensive meals from breakfast to dinner. Great view of the Sierra and excellent moles. - Wood fire grill, great pizzas and salads. Best pizza - the one with pine nuts. - Grasshopper-filled chile rellenos and other traditional Oaxacan cuisine. - Yummy ravioli and tasty pizzas from a wood-fired oven. Tasty treat recommendation - La piedina. - French-inspired dishes include rabbit in mustard sauce and chicken in cordon bleu. - Clean restaurant with a variety of Mexican dishes. Three blocks south of La Merced Church. - There are several sections to this restaurant, including a ground-floor café and an upstairs restaurant. The complex sports an indoor children's playground, Terralandia. Recommended - Puntas de Filete Albañil. - Fish tacos, Baja California style! Eager to learn the art of Oaxacan cooking? It's easy to arrange hands-on cooking classes! In Oaxaca City, check out Casa de los Sabores. Out of town check out Seasons of my Heart Cooking School in San Lorenzo Cacaotepec, Etla. If you want classes from locals en español, there are plenty of options, many of which are incorporated into Spanish education programs from the language schools. What's missing (so far) are classes taught in Spanish. They can be arranged on site, but it's hard to recommend particular cooks willing to teach personalized classes. - Local chain of Italian restaurants with some of the best pizza in the country. A local fave is called the poblano with Oaxacan sausage, green pepper and corn. A vegetarian option is called simply La Rústica and is highly recommended. - A very veggie favorite. The lunchtime comida corrida is excellent. - Local chain of Italian restaurants with some of the best pizza in the country. The vegetarian option is the house specialty, La Rústica. - Great salads. Located on the north side of Labastida Park. For those who wish to try grasshoppers, there are plenty of options. Fresh batches of the bug are for sale at markets, including Benito Juárez and Abasto(s). There's a mobile cart often seen on Alcalá whose motto is 'Desayuno Ejuctivo.' Loosen your tie and eat a tamale! Empanadas Carmen, Calle Carranza on the north side of Carmen Alto Church, Monday-Friday, 6pm-1030pm. The restaurant at the Oaxaca airport is one of the best of its kind. Pitchers of fresh juices are displayed at the entrance and meat eaters are rewarded by the tasajo dish served in a salsa made from three chilis - arbol, pasilla and guajillo. Mmmmm! Other nearby restaurants include Hacienda San Agustin and La Escondida. Breakfast hours are generally 8-10 in the morning, lunch 2-4 in the afternoon and dinners often don't begin until 8 in the evening. Do you want to get to know a different side of Oaxaca? Challenge yourself with a treasure hunt!